halloween is just a few days away and we've got big plans...no wait, that's right we are super boring and we don't! haha! we do have a couple of fun halloween traditions like having a "scary movie night". sometimes scary movie night is a big party and sometimes it's quiet night with just the two of us. this year it will just be the two of us but i still want it to be a "big spread" and i thought i would make shaun a quick card (don't worry, he doesn't read my blog much). -i started with a 4-1/4 x 5-1/2 piece of watercolor paper and watercolored a quick background with distress ink peacock feathers. when it was dry, i added some splatter in the same color. then i stamped a few stars from the essentials by ellen got candy set. 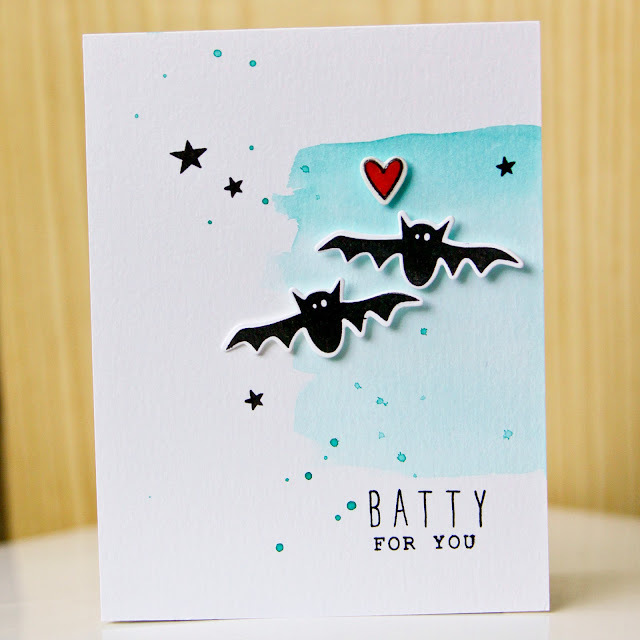 i stamped "batty" with the mama elephant bella letters and "for you" from the mama elephant happy everything set. 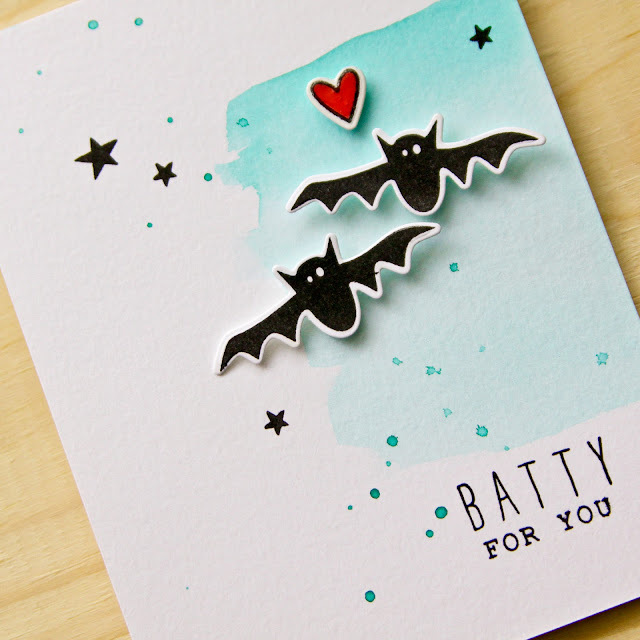 -with my background ready, i stamped the super cute bats from the essentials by ellen got candy set in versafine onyx black and die cut them with the coordinating set. -next i stamped the little heart from the lawn fawn milk & cookies set in versafine onyx black and watercolored the inside with distress ink abandoned coral. then i die cut it with the coordinating die and gave it a good coat of glossy accents. -when my glossy accents was dry, i foam mounted my bats & heart to my background and then the whole thing to a solar white card.